The day has finally come, the Doopydoo's resin kit has arrived and I can start building. - I picked up parts of a real folding stock (mainly the buttplate) and some mold/resin kit to make a resin version of the buttplate. In addition to the parts from T-Jay and some trimming of the doopy stock, I should be able to get it working. Now I know it won't be as sturdy as a real folding stock, but I want to make it working and keep the lighter weight. - There will be a working charging lever/bolt that when pulled back will actually trigger the reloading. I think this will be the hardest part for the electronics. Im still debating how to actually implement it. Do I make it so you have to pull all the way back and then it will fully reload, or do I make it incremental, so pulling back halfway only recharges have the ammo count, etc, perhaps steps at 1/4, 1/2, 3/4 and full. If anyone else has any additional ideas I'd love to hear them. I picked up a more accurate replacement resin magazine, but it hasn't arrived yet. Here's to a fun build, more to come. When I think of an operational folding stock, which also has to be light weight, the first thing in my mind is the kit from @fieldmarshall. Don't want to keep you from building your own stock, I was just not sure if you were aware of that option. You are based in the US, so even shipping would not be an issue. However, I would totally understand if your prefer to build your own and keep this option as a backup plan. Really looking forward to your build Marko. The pulling of the charge handle for different electronic effects is very ambitious indeed. Not to mention upgrading the folding stock to make it functional. A steady step-by-step approach will prove very valuable given the complexity of your build. I wish you all the best and look forward to your posts. I didn't get as far as I would have liked, but I had to get my workshops set up, and that took some time to organize. Its been 5+ years since I used my old jewelers bench, so a few trips to the hardware store, I got everything I needed to organize. CDO (OCD spelt alphabetically as it should be) has its advantages sometimes. At least I finally get to use my wax tools again. Once I got my model making setup done, It was time to organize the electronics setup. Between Amazon and eBay, I had electronic parts come in every day for 2 weeks (Yey for free shipping), so they all had to be organized and sorted. I may have gone a little overboard on the electronics parts, but maybe I'll find other stuff to build afterwards. I started by creating a blue print of the trigger and handle reference image. Once I had the template done, I marked up where I wanted to place everything. Thanks to @Dracotrooper for some of the inspirations. I am using the 3 position switch from @T-Jay's kit as well as adding a vibrating motor for the shot feedback, mode button to play the soundtrack files (thanks to @skyone), i.e imperial march, and finally a potentiometer to control the volume of the sound. I don't think I will be changing the volume too much, so I am hiding it as part of the bottom screw of the handle. I am going to attach the two together, so I will need to carry a small hex wrench or something to change the volume, but this should be the best and easiest place to hide it. I soldered 6" of stranded wire to each of the components except for the speakers which have 2'. I'm not sure where I am putting the speakers yet so I wanted to leave them as long unaltered lengths. Added heat shrink tubing to protect the solder joints. With all that done, I can start on the resin work. Created a template for the trigger. While trimming the trigger, I took off a little too much off the back of the trigger, so I had to add some more green stuff to the back and build the top portion. Next up was cleaning up the edges and joints, carving out the channels for the aluminum plates, switch and size screws. I used a drill press to drill out the bottom screw and a 8" bit to drill all the way through the handle. Once I knew where to drill from the top, I used a drill bit a little bigger than the potentiometer, to drill down to the bottom, leaving enough resin to keep the part inside the handle. Testing fitting the rotary switch and mode selection button. Well, thats all I have done for now. Thanks for reading. I was not aware there was a kit available, I didn't show up when I would search. At least I know I have options if mine doesn't pan out. Yeah, after reading through your build, it made me want to go all out with this. I'm sure your workbench is the envy of many, including myself. 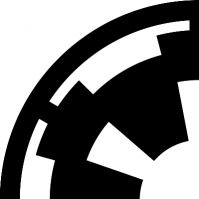 Oh, elated for you that you have the Imperial March in your soundFX - way and SO very cool!